London commuters are getting the chance to swap the cash in their pocket for a digital wallet. 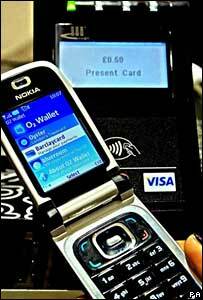 500 travellers have been issued with Nokia phones which swap digital cash via the technology used for the capital's Oyster travel card. The phones will double as a travel pass and wallet that can be used to make small value payments. Swiping the phone against special posters will give participants access to information or local maps. 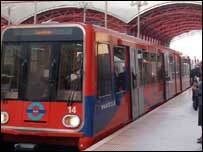 The trial uses the same Near Field Communications system behind the Oyster card. The phones will be loaded with £200 for the users to spend during the six-month trial. Using that cash on the transport system will be simple enough, but the triallists may struggle to find shops where they can make small payments. The contactless payment terminals are only installed in around 1,000 shops and cafes - mainly in the City of London and at Canary Wharf. Customers can use the phones or cards to make payments of up to £10. Cath Keers, O2 UK's customer director, said the "mobile wallet" was an idea whose time had come, because mobile phones were already seen as many people's most vital possession. "Research shows more people are likely to go back home and get their phone if they leave it behind, rather than return for their wallet," she said. O2 is working with Barclaycard, Visa and Transport for London on the trial, with all the partners keen to learn whether customers are really interested in making payments by phone - many are likely to be worried about security. The triallists have been given a single helpline to ring if they lose their "mobile wallets" and have been told that Barclaycard will meet the cost of any payments made on a stolen phone. Digital money is an idea which has been a long time coming to fruition. In the 1990s the Mondex electronic cash system was tried out in Swindon but failed to win sufficient interest or trust from customers or retailers. But mobile payment services are in use in Japan and South Korea where they have proved popular. O2 believes British customers are now willing to embrace the idea - but they will only get the chance if the trial proves successful. A full scale launch of the mobile wallet service may come in late 2008.